In 2010, Nicolas, Werner and I met each other for the very first time in Brussels. We had already worked together for a couple of years online, and while I individually met Nicolas and Werner before, it was our first real life encounter in the same place. 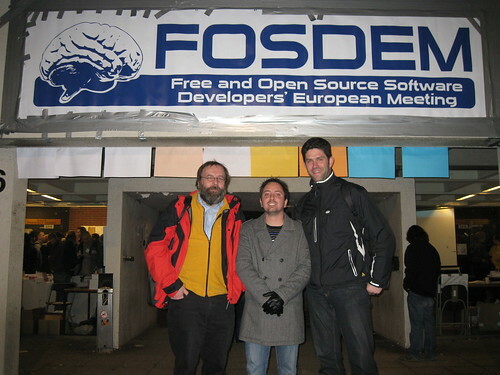 That place was FOSDEM, the largest open source conference in Europe. For the upcoming edition of FOSDEM 2017, taking place during the first weekend of Feb (4-5), we are coming together once again, but this time we hope to do this with as many MuseScore users and contributors as possible. So if you like to join us as well and enjoy a great time together at FOSDEM, including a dinner on Saturday evening, then leave a comment on this post or reach out to me directly. Hope to see you in February! Wish I could make it. Maybe next time! But I'm glad so many of you will be there together. Edit... definitely not. Have a good time ! Nice to have been there and be able to match faces to people. Yeah, you're so dynamic and young-sounding ;) take it as a compliment. Unrelated note, but I have to ask... If you look at the actual user number for each of your guys's accounts, it goes 1 (thomas), 3 (werner), and 4 (lasconic). Where'd user 2 go?